If you read my previous article you probably think I really do hate Windows Phone 8.1, but I don’t. In fact, I actually love it. I think it is one of the most compelling mobile operating systems that I have ever used. It’s definitely not without its flaws, but please allow me to tell you why I think more people should give it a chance. 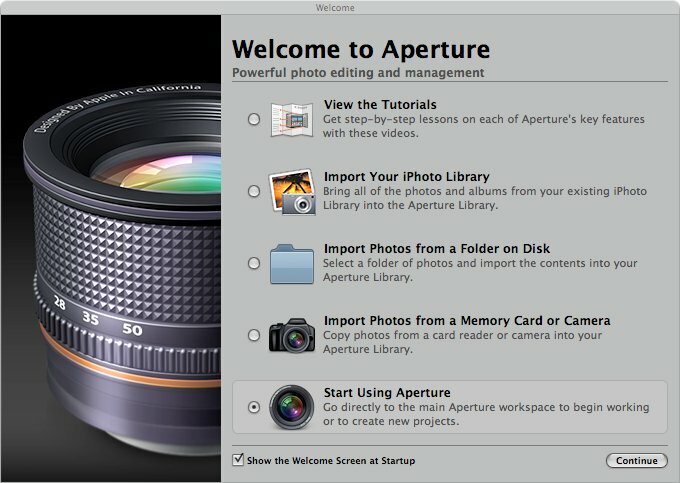 Last month (May 2007) I wrote a blog entry about Aperture. At the time I was house sitting for my sister who had just got a new iMac. When I came home I was disappointed that I didn’t have a similar application to use for working on my photos. Last fall I had played with the Adobe Lightroom Beta and it was extremely slow on my computer so I didn’t really give it much thought. Then I decided to download the trial and give it a shot anyways after thinking that it might actually perform better now that I have a dedicated graphics card with 128MB of memory instead of the motherboard’s integrated GPU which only had 32 MB of RAM allocated to it. The following will be my thoughts of Lightroom and I will be comparing a lot of it’s features with the experience I had with Apple’s Aperture. When you first open Adobe Photoshop Lightroom you are asked where you want to import images from. 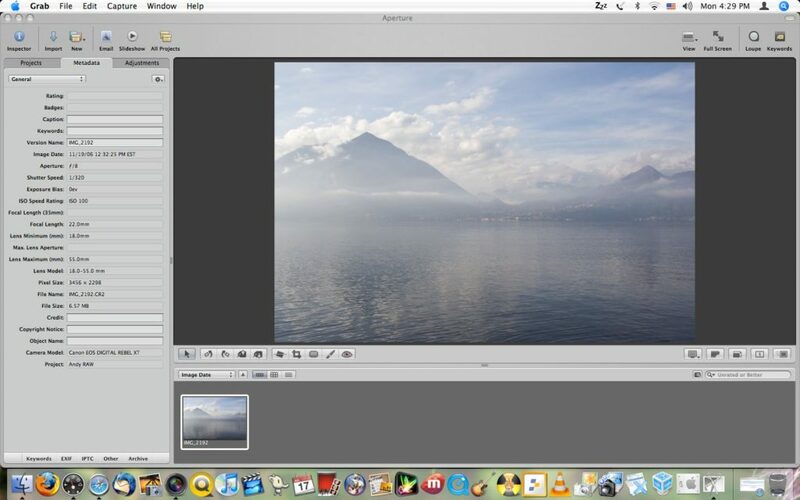 You can choose to import images from your camera or from a location on your computer. Once you choose and your images have been imported they are placed into the Library. You’ll also probably want to change the view from “Loupe View” to “Grid View.” This will allow you to see all of the images that you just imported. Also, it’s easier to go ahead and rotate your images from this view before you get to adjusting the images. Once you do get your images rotated and you are ready to start adjusting them, click on an image that you want to work on and then click on Develop, this is where all the adjustments will take place. When you’re in the “Develop” mode there are a lot of adjustments that you can make. The first adjustment that I usually make is the white balance, exposure and contrast. Lightroom has a few pre-programmed presets for adjusting tone curve and this is what I usually use because they seem to work pretty well for me. If you find yourself applying the same adjustments to more than one or two images you can create additional presets. The next adjustments that I make are of the colors. This is my favorite feature and one that really makes Aperture and Lightroom worth their pricetags. My camera doesn’t do a great job of applying saturation to images, which is acceptable in some instances because the camera might apply too much and it would be hard to correct in post processing. I usually find myself increasing the saturation of blues to make skies bluer and greens to make leaves much more vibrant. If the color you see is a bit odd from what you remember seeing you can change it’s hue and luminance. I want to talk a little bit more about the lighting adjustments that you can make using Lightroom. You can use the tone curve tool or you can use sliders to adjust the lightness or darkness of highlights, dark areas, light areas and shadows. You’d be surprised by just how much better you can make an image look by slightly tweaking the tone curve. An adjustment that I find myself needing quite frequently is a sharpening tool. Lightroom’s got one and you don’t have to add it to the panels every time you open a new image like I did in Aperture but, I have never seen any difference when I have used this tool. I don’t know whether it’s so subtle I just don’t see a change or if my monitor just isn’t all that great. What I’ve been doing is when I’m finished with the photo I export it out and sharpen it up in an external editor. If you’ve got multiple images of the same thing and you need to compare them Lightroom has you covered there as well. 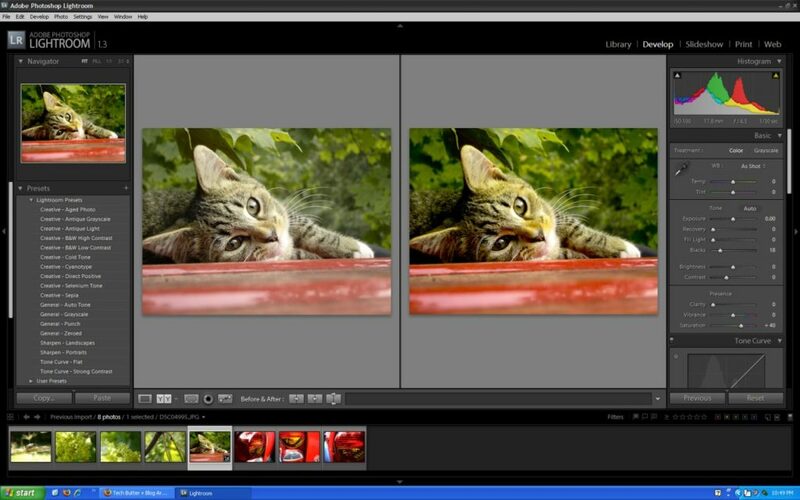 The only downside to Lightroom’s comparison feature is that you can only compare one photo at a time. In addition to the comparison tool Lightroom has a tool that I really like called “Before & After.” I really like to use this to see just how much better my images are once I’ve adjusted the lighting, saturation, etc. Another great feature of Lightroom that most good photo editing applications are incorporating these days is non-destructive edits. Like I mentioned in the Aperture review, it is really nice to be able to make changes to images and a year later come back and still have the original images. You’ll want to make backups of course, which is built into Lightroom, but, every good photo editing application will have this. I am happy to say that cropping images in Lightroom is much easier than it was in Aperture. At least the figuring out how to do it part. When I was using Aperture it took me a while to figure out how to crop an image, in Lightroom it was much easier to understand. What I really liked about Lightroom is that when I cropped an image and made changes to the image, if I zeroed the image out the crop would stay. I thought that was really nice. Lightroom is resource intensive. I know I don’t have the most powerful computer on the planet, but still, it’s resource intensive. I couldn’t use the application if my computer’s display was running at 1280×1024, I’d have to decrease to 1024×768. I had to close out of all other applications that I was running. Even running Skype and Lightroom at the same time would cause my computer to lockup. Even with closing all applications Lightroom still isn’t very fast, sliders occasionally become unresponsive and images take their precious time loading. You really need a modern computer to use Lightroom effectively, something faster than my AMD Athlon XP 1700+, 128 MB GPU and 1 GB of RAM. If you need to see what your image looked like before you applied an adjustment you can use the history panel. In my opinion it’s not as nice as Aperture’s ability to hide an effect by clicking on a hide icon beside of the adjustment. Another feature that I really miss from Aperture is full screen editing. You can hide panels very easily in Lightroom, too easily sometimes, but it doesn’t compare to being able to edit an image in full screen mode. I really miss that and hope to see it in Lightroom soon. Like I mentioned previously, in my opinion the sharpening tool does not do anything for images. I’d like to see this corrected. Also, I’d like to see some sort of tool to go along with the sharpening tool so you can further define where you want to apply the sharpening to. Although Lightroom is missing a lot of things that I really liked when I was using Aperture, I think Lightroom is a great piece of software. It’s only at Version 1.0 at the moment so I’m sure better things are to come. If you’re needing photo editing software and you’re on Windows, I would highly recommend Adobe Photoshop Lightroom. If you’re using a Mac, I’d recommend sticking with Aperture. Both Lightroom and Aperture are $299, which in my opinion is a bit steep. However, it is cheaper than buying a copy of Adobe Photoshop and both applications are much easier to work with than trying to learn how to edit your photos in Photoshop. Last night I was chatting with my friend Steve and he mentioned that I should install the Aperture trial. I thought it was a great idea so I did and here are my “first look” thoughts. When you first start up the application you have several options to get started. You can import your photos or one of the best things about the first launch that I like is the fact that they have provided quick start tours. What I hate about these quick start tours is that you have to access them online. As you would expect from an Apple product, importing your photos is easy. However, the image import process seemed a lot slower than it does when I import photos through iPhoto or manually off of the memory card. My guess would be that when the photos are imported, EXIF data and a lot of other information is determined about the photo instead of waiting until you actually open the file. That is my guess. As I patiently waited for my images to import I looked around the application and liked what I saw. The application appears to have a lot of features but they didn’t clutter the application up with a ton of icons and make it hard to understand. Once my photos had imported I was playing around with my photos in no time. The first image that I opened and started playing with I wanted to sharpen the image up a bit. It took me a little while to find the tool to do it. I had to add a panel to the adjustments panel. Once I did, I was impressed. Not only did I use the sharpen feature to sharpen up the image but there was also a way to adjust the radius of the sharpen effect. I was extremely impressed. The image I was working with was a little out of focus but that feature really improved the image. I used this technique on several other photos and it really brought out parts of the image that would otherwise go unnoticed. The technique above works really well and really makes a lot of my images look so much better. The only problem with this is that every time you open a new photo to edit you have to add the sharpen panel to the screen again. Annoying. I also don’t see anywhere to make this a standard option. The next thing that I am completely in love with is the fact that when you are in full screen mode, looking at your images, you can move the toolbars around. You cannot do this in iPhoto or Picasa, which is what I primarily use on my PC at home. Although this feature may seem like a small one, it’s definitely a great feature for me when you are looking at portrait type images where the main focal point of the scene is at the bottom. Also, you can add the panels for adjusting your photos while you are in full screen mode. As you are working with the images you can un-check the check box beside each adjustments panel to hide those effects. It’s really nice to not have to undo each effect just to see what it looked like previously. When I got to the point where I wanted to crop an image I was a little bit confused as how to crop the image. I knew to go to the toolbar item at the top and to select the area of the image that I wanted to keep. The problem is, I didn’t understand how to apply that effect. Finally, I clicked on the pointer icon in the toolbar and that applied the crop. Although it’s simple once you figure it out, it takes a little while to figure out. When I first launched the application I really did not feel as though this application was necessary, for me. To me, it simply looked like an expensive application to organize and do some more advanced changes to a photo than you can in iPhoto. However, I have been playing with Aperture the past few hours and I have noticed that there are a lot of changes I can make to an image, a lot of subtle changes especially, that make the photo a whole lot better. A feature of Aperture that is a truly must have for any photo organization/manipulation tool is to not overwrite the original images. Using Picasa I have had this feature for a while now and would not want to have it any other way. It’s really nice to be able to make changes to an image and then a year later come back and still have access to the original files. Where Aperture really shines is the RAW support. Taking RAW photos gives you the ability to adjust virtually every detail of a photo. The camera takes a picture of what it sees without adding any effects or adjustments to the saved image. Once you pull the images from the camera you add the sharpness, color saturation, exposure, etc. iPhoto has RAW support but it’s very limited in what you can adjust. Aperture on the other hand gives you tons of options for adjusting your photos. You can take an image that was a little too bright when it was captured and make it a little darker, more saturated and sharp to enhance the beauty of the image. Aperture will truly show you the reasons an image captured in RAW format is so much better because you can truly make it an impressive photograph. If you are like me when you take photos you’ll wind up pulling 10 or more (ok, usually a lot more than 10) images off of your camera of the same thing. For me this ensures that I get a great image. Most photographers do this as well. Usually if I take more than one photo of the same thing I reduce the risk of someone’s eyes being closed or sometimes they’ll be slighty turned in one photo and you didn’t really think about them being turned that way but it turned out really well and you’re glad you took more than one. Aperture really helps out in this. You can add stars to your images. You can add 5 stars to perfect images and 1 star to a poor image. Another way Aperture helps out in the multiple photos department is stacking. Aperture looks at your photo collection and groups similar photos together. This allows you to easily see the different groups of photos so you can easily find the image you are looking for. I was really impressed with how well Aperture was able to separate the images where I had simply moved the camera to a different angle but not separate images that the camera was still in the same location but moved slightly due to the simple fact that I was holding the camera freestyle. If you’ve ever used Picasa or a similar photo editing application, you’ve probably tried to increase the saturation of the colors in your images but if you went too far you’d get a lot of little blue splotches. Instead of increasing the saturation of colors overall which is how most other photo editors increase color, with Aperture you can increase a specific color. Aperture doesn’t pull out every single color of your image but it does have a palette that allows you to choose a basic color then you can increase or decrease that color. This is something that you would typically only be able to do with Photoshop or a similar application. Aperture has so many features, I’ve barely scratched the surface. It’s a great application and I have had a lot of fun with it. The images that I have edited using the software look absolutely fantastic (even if I say so myself). They look a whole lot better than anything I could have done using what I currently use, which is Google’s Picasa. The final question boils down to this, “Is it really worth the $299 price tag?” To answer that question I would have to say yes. I’d say yes especially if you cannot afford Adobe Photoshop. 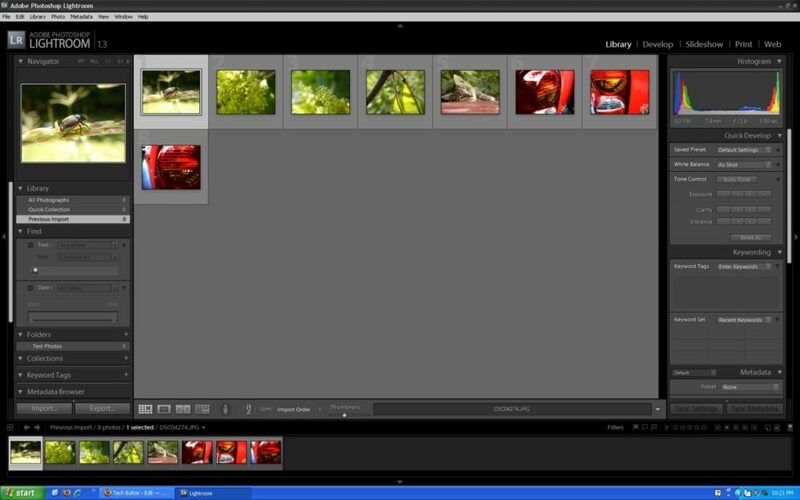 Aperture gives you so many tools to make your images look great and makes it really easy to do. 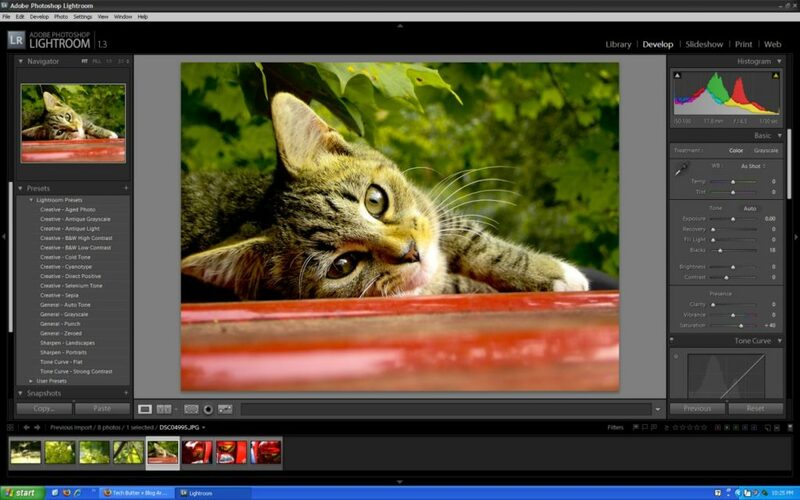 Even though this application has tons of tools for editing RAW images, the other photo editing tools are great for even a point and shoot camera. The non-destructive editing feature of this application alone is a major plus. I haven’t really mentioned the great photo and project organization capabilities. There are a lot of features! I’ve had a lot of fun with it and hopefully, someday, I can afford a copy of it! Article update: Wednesday, October 8, 2008: Since the original writing of this post Apple has released Aperture 2. I have updated this post with screenshots from that version. I’m happy to report that Aperture 2 is a whole lot better. What Apple got wrong in the first version has been corrected in this version. I think that Aperture 2 is definitely a lot better than Adobe Photoshop Lightroom. 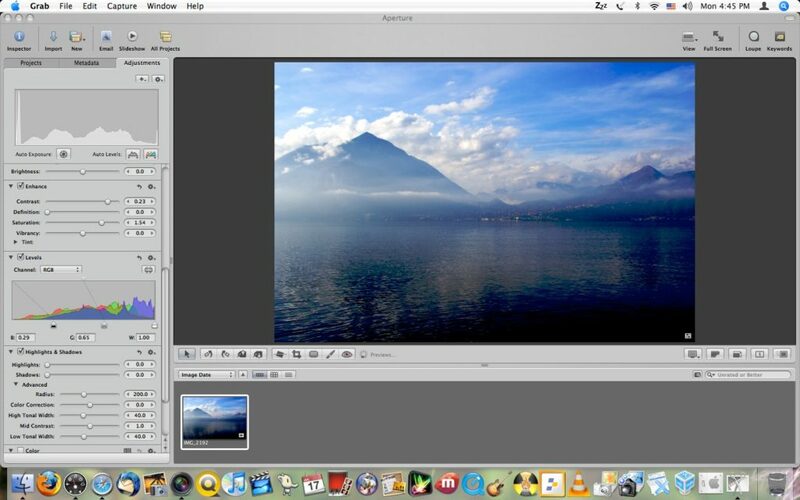 If you’re on a Mac I would definitely recommend Aperture over Lightroom. Apple re-arranged the application. The problem with the sharpening panel and the cropping I mentioned above has been fixed. Both are more accessible than in the previous version.